Need a blue wig for Halloween? Blue wigs are great accessories for fairy costumes, mermaids, Marge Simpson hair and more. Buy blue wigs in short cuts, long styles, with bangs, curly or straight. 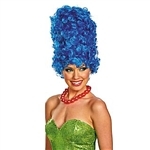 We even offer a tall beehive a-la Marge Simpson! Great ideas for cosplay, roleplay and dress-up. form the Blue Woman Group Unique rich color Fun and Flirty! I'm feeling Blue today!